On our last trip to France in April 2017, I spent the last afternoon in Paris taking photos inside the Cathedral of Notre Dame. We met our French "daughter" and her family for lunch on Sunday before our last day and walked around the Cathedral after lunch. Our French daughter was a foreign exchange student who lived with us in St. Joseph, MO during the 1989-90 school year. We have stayed in touch with her over the years, visiting her in Paris several times and once she came to visit us in Chapel Hill about 10 years ago. I am so glad I spent that afternoon inside Notre Dame and that we had a walk around the outside as well. The interior of the Cathedral looking towards the altar. It was an emotional trip for me. Nice...the last time I saw Notre Dame was in 1969! Lucky you, to live there. hope the lower stained glass survived. had a 1870's church in milw burn. We were fortunate to be there on a beautiful spring day. I was over there in 1992 for 5 days, never got a chance to see it up close. I would never have thought to do that. Oh, no. To miss it by one day! Exquisite photos, thank you. 2004 the last time in Paris. Saw Strasbourg in 1976 and it is breathtaking. 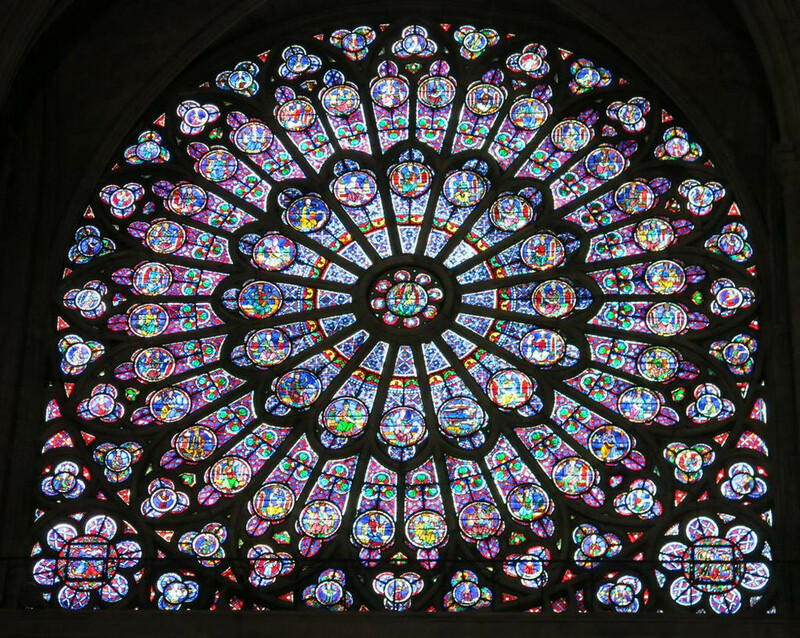 the North Rose window had the largest amount of original glass. I bought copies of them imprinted on glass. Photography really can't duplicate the experience of seeing light through the windows. boxed up. I wonder how the gargoyles and grotesques fared. Photography really has changed, hasn't it? 11. It was an emotional trip for me. I knew it would be the last trip to France with my husband which was where we had spent a month on our honeymoon 32 years earlier. for posting these and for sharing the story behind your visit. 12. Happy to share them. April in Paris really was beautiful. 7. Nice...the last time I saw Notre Dame was in 1969! I was living in a pension on Rue du Four. To live in Paris. Photography sure was different then. 46. Lucky you, to live there. I visited in 1975, have trying to get back ever since, whether as visitor or resident. I've been thinking that I'm glad I saw it once and climbed those towers. 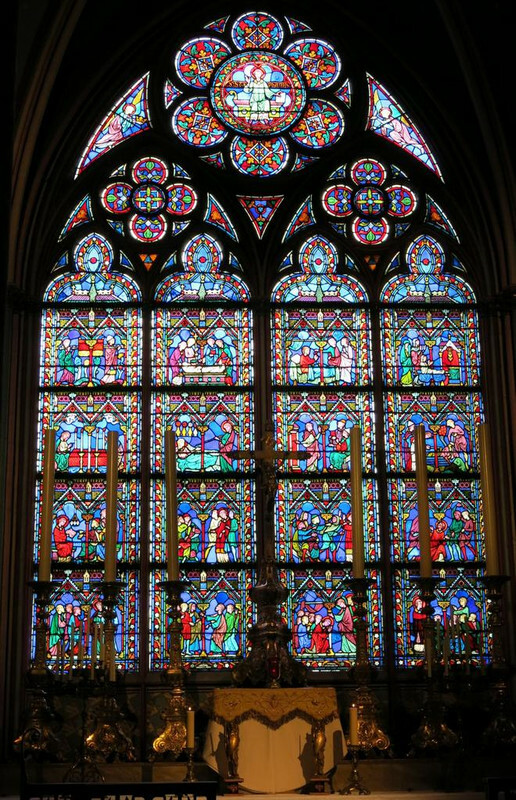 8. hope the lower stained glass survived. had a 1870's church in milw burn. the brick shell survived & they are gonna rebuild it. some stained glass survived. also the altar jesus painting. That there are reports the two big Rose windows were saved. Having a dramatic subject makes it a lot easier to get a lovely shot! 27. We were fortunate to be there on a beautiful spring day. We started this trip in Strasbourg and I was disappointed to see much of that Cathedral surrounded with scaffolding. It also has an amazingly beautiful Rose window. They brought back wonderful memories. 21. I was over there in 1992 for 5 days, never got a chance to see it up close. on this trip. We'd never had a hotel so close which made it easy to choose walking by it after our lunch. There's so much to see in Paris. uplifting part of life. Something that highlights a part of history that is rich with artistry in a religious setting. For over eight hundred and fifty years this building has stood through time. Watched a number of French monarchies rise and fall. Two World Wars. 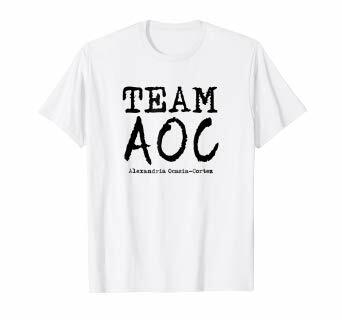 All of that followed by the economic and political upheaval we see today, as well as the recent mass murders through the streets of Paris by terrorists. I hear that it was some kind of accident that brought this on. Well the world waits to see if the firefighting personnel can save this building and save history. Of hundreds of firefighters has resulted in saving the main structure. 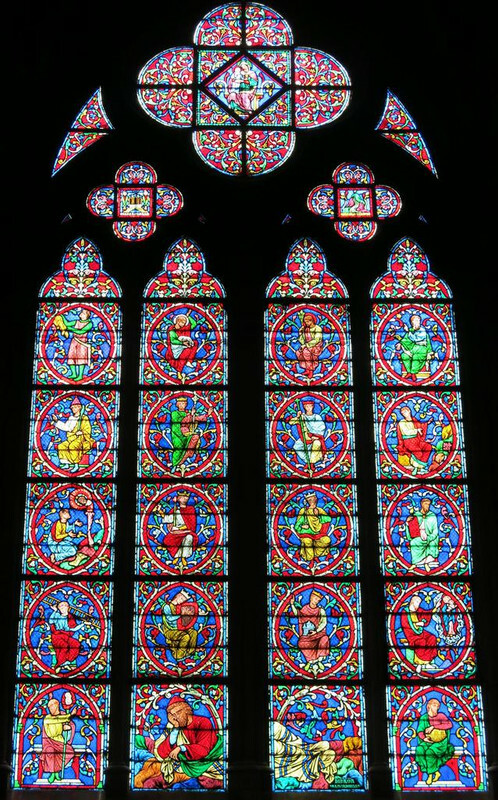 Apparently only one of the Rose windows has been destroyed and most of the rest of the stained glass appears to be intact. Unbelievable given the video of the intensity and extent of the fire. Was to stand in the plaza in front of Notre Dame and watch the day begin behind the cathedral. 32. I would never have thought to do that. I'm a huge fan of shooting dawn. We were going to tour Notre Dame today, but naturally no one can even get close. Roads are blocked off. The crowds are insane, everyone trying to get a closer look. I did manage to take some photos which I'll post next week, when I get home. 31. Oh, no. To miss it by one day! It is a tragedy. I am amazed that the firefighters were able to save the main structure. That fire looked awful. 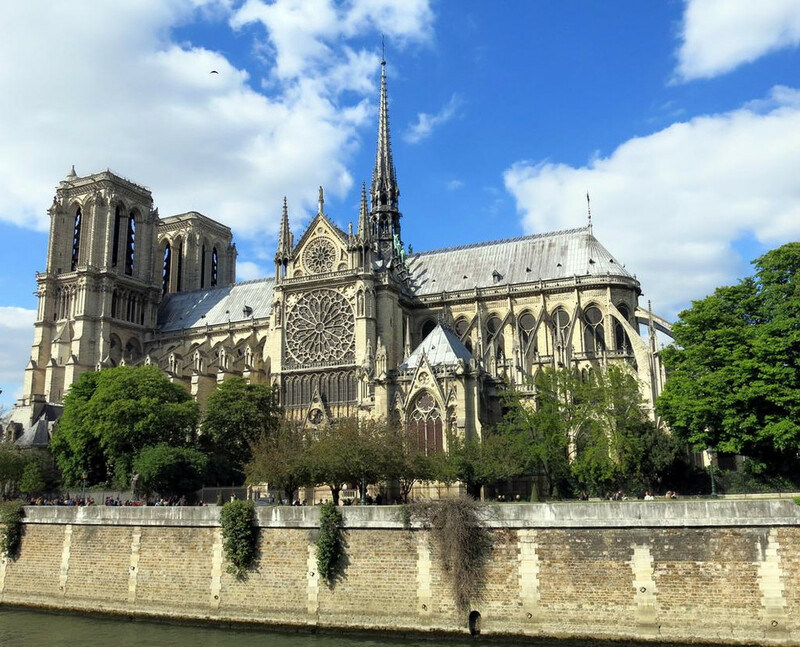 It is said that Notre Dame will be closed for fifteen years. And yes, it is a shame to have missed touring it by one day! Very sad day for Parisians. the vaulted ceiling acted as a firewall which helped protect the interior when the roof collapsed. There are wooden pews and a pulpit that didn't burn. And I've seen reports from organists that the organ also wasn't destroyed. 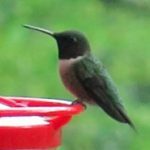 I saw another report estimating 15 years for total restoration, but that it could be as little as 5 years for the minimum to be done for it to be open. Construction always takes longer than expected. The firefighters are real heroes. I hope their work in getting ahead of the fire is recognized because I suspect the damage would have been a lot worse. 35. Exquisite photos, thank you. 2004 the last time in Paris. 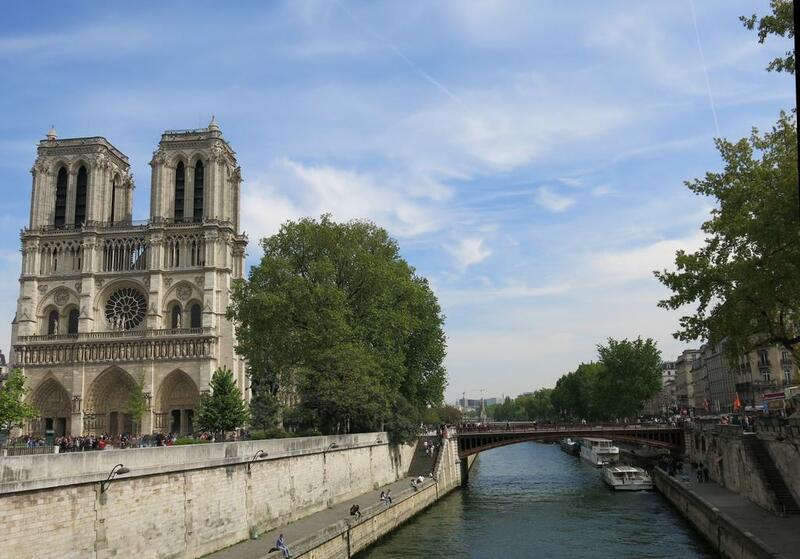 We've enjoyed touring Notre Dame and the wonderful sites of Paris several times. There's nothing like it in the world. 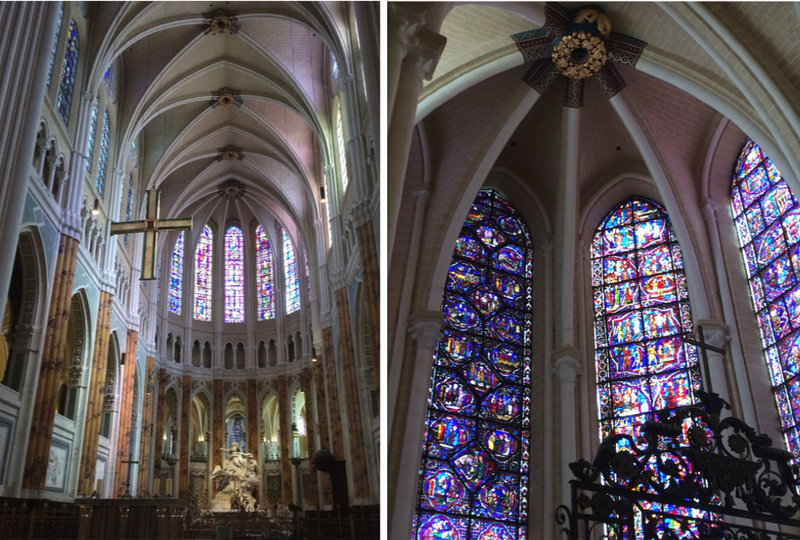 Chartres is also spectacular like other cathedrals in Europe. We started this trip to France in Strasbourg. I was really impressed with the Rose window in the Cathedral there. 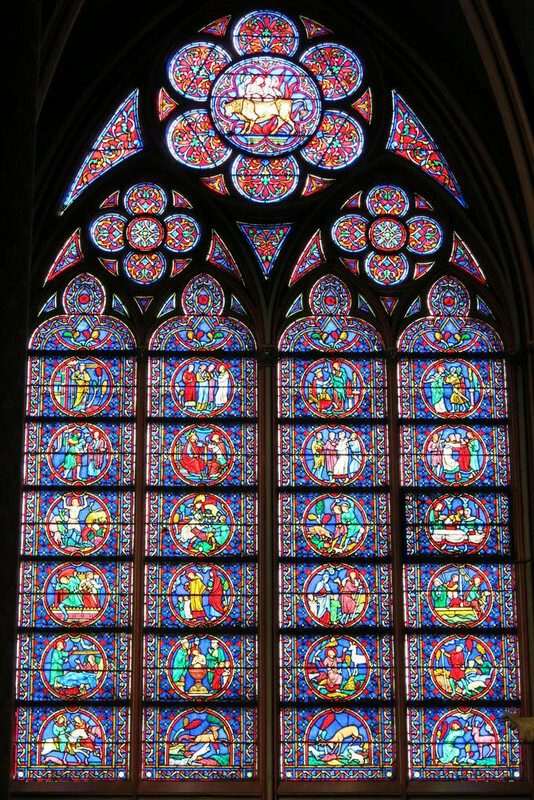 In fact, I thought it was at least as marvelous--if not more so--as the Rose windows in Notre Dame. 44. Saw Strasbourg in 1976 and it is breathtaking. Some U.S. Protestant Christian denominations sent a group of representatives to meet with the American, North and South Vietnam leaders of the Paris Peace Talks. I was fortunate to represent the Disciples of Christ denomination. 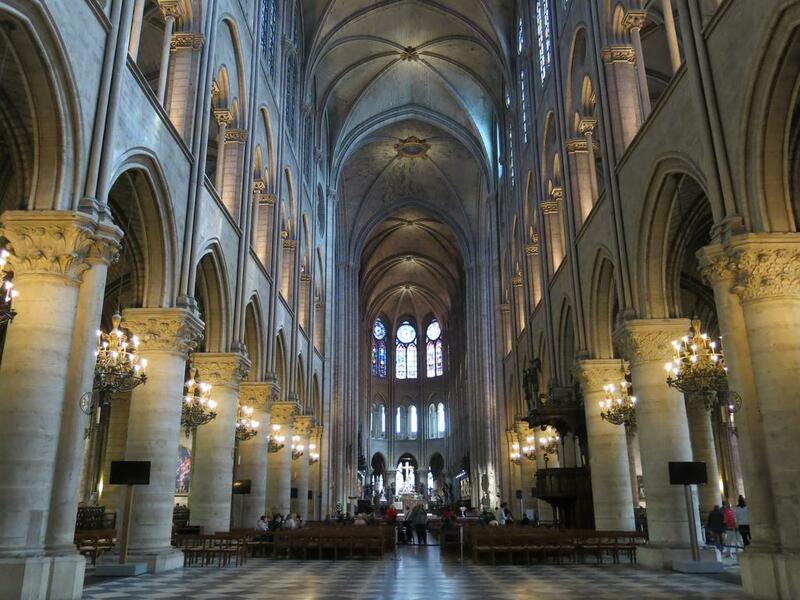 Soon after I landed at DeGaulle I walked into Notre Dame which I had always wanted to see my. A choir was singing and the sun was shining through the Rose windows. 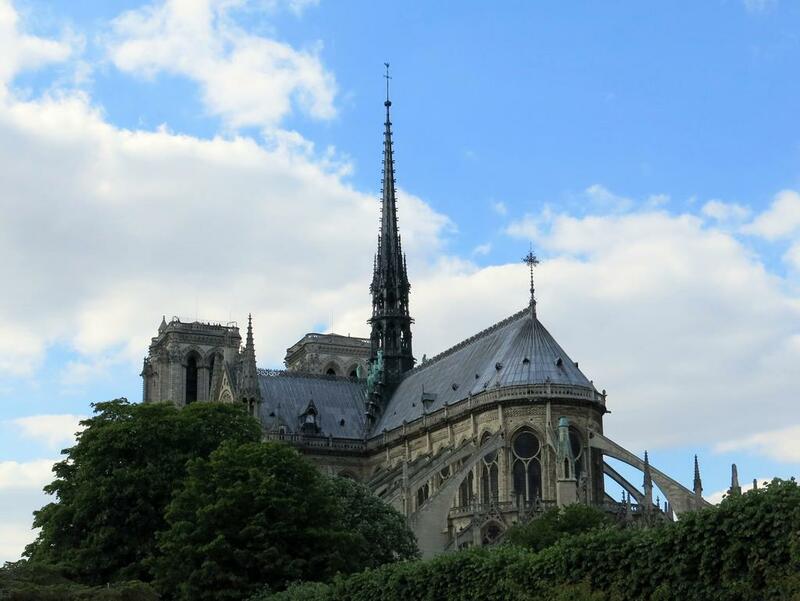 I was overwhelmed and in tears and have been so grateful my whole life to the French for giving this wonderful cathedral to the world. 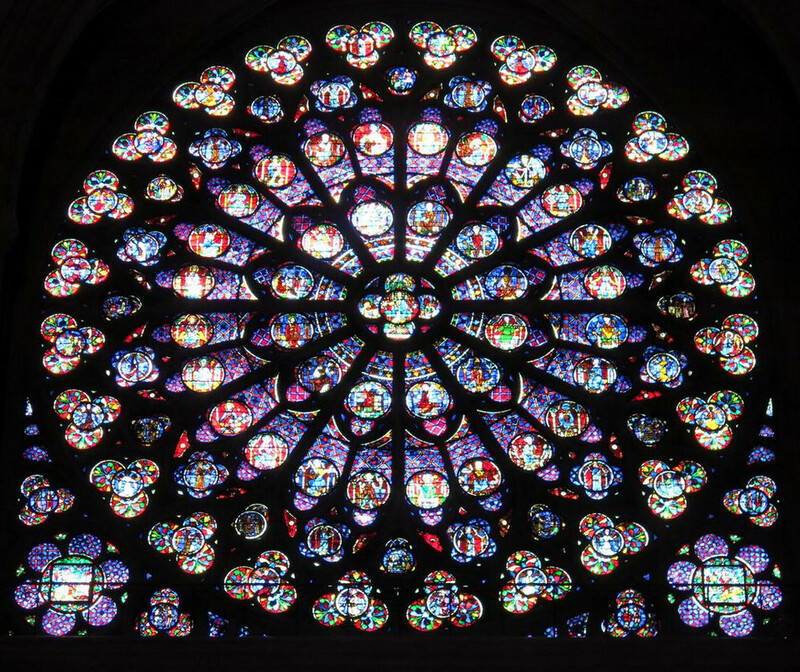 --and certainly wasn't able-- to capture the glorious beauty of the sun streaming through the south Rose Window (which is the one facing the Seine). It was late afternoon when I was there this time and the colors coming off that window were spectacular. I could not get a shot that captured the magnificence of the effect. It is a glorious Cathedral. And thank you for sharing them! We were there in 08 and it was beautiful and hot that day in July. But the camera did not capture the scenes like yours. All of my photos are dark and awful. 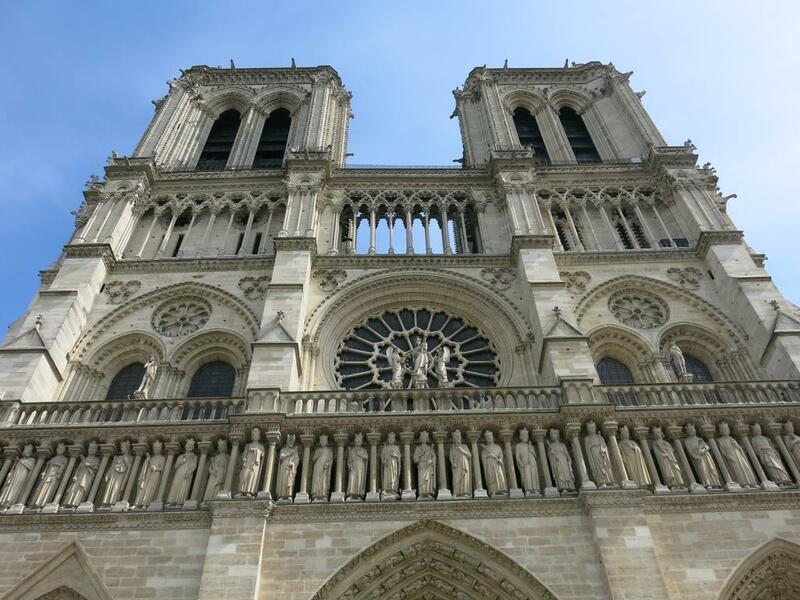 I grew up a mile from Notre Dame in Indiana so I was really excited about seeing it in person. The tourists were noisy and disrespectful. I even shushed a crowd of noisy teens. I was nearly in tears at the beauty of it, the history, the age. Sad it will never be the same. that the French will do a masterful job of rebuilding Notre Dame. It has had reconstruction over the ages. There are so many exquisite Cathedrals all over Europe that require maintenance and repair. But I don't expect to ever see it again as it was that day in April two years ago. I'm 68 and if it takes 15 years or more to make the repairs, I doubt I will be up for international travel if I'm still alive. Paris is only a four hour drive from my home in Switzerland so I skipped going there in September when we were in Paris last. We saw Versailles that weekend. Now I really regret not revisiting Notre Dame last year. In 15 yrs, I will be 75 so I hope they finish it too. My traveling days are numbered too. Thanks again. Wish we had taken more photos inside.